Figure shows climate change vulnerability index that integrates change in temperature and precipitation, normalized hazard frequency per decade and social vulnerability score. Gradation of red indicates high climate change vulnerability. New research from the University of Georgia assesses the communities in the state most vulnerable to changes in temperature and precipitation. The study, published May 18 in Applied Geography, examines not only the sensitivity and susceptibility of populations that are vulnerable to flooding along the coast but also the social vulnerability of inland populations in Georgia. The research presents a vulnerability assessment of Georgia based on county-level statistics from 1975 to 2012. 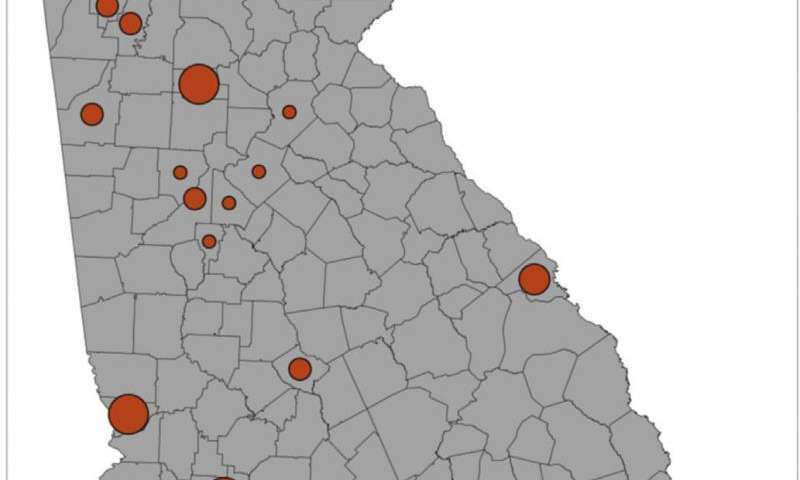 The research finds that climate vulnerability is highest in some metropolitan Atlanta and coastal counties and in the southwestern region of Georgia and rural parts of inland Georgia. "This study blended physical science and data on social vulnerability to provide insight for stakeholders and policymakers," said J. Marshall Shepherd, Athletic Association Distinguished Professor in the Franklin College of Arts and Sciences and co-author on the study. "Irrespective of what you believe causation to be, our Georgia cities are becoming more vulnerable to heat and flooding, our coastal areas experience nuisance flooding on rain-free days because of sea level, and some of our agricultural regions experience more frequent drought." Social vulnerability to weather and climate events refers to communities that may or may not be along the coast but because of their citizens' advanced age, lack of resources and/or education, these communities have a lower capacity to adapt to, or change, aspects of their lives that may be affected by climate change. "The social vulnerability index comprises socioeconomic indicators including the elderly population, the infant population, racial/ethnic minorities, average educational attainment and the unemployment rate," said Binita KC, postdoctoral research associate in the school of public policy and urban affairs at Northeastern University and co-author on the study, who conducted the research while a doctoral student at UGA. Figure shows the death rate caused by exposure to forces of nature, which include excessive heat, cold, earthquake, storm and so on from 1979 to 2013. Only death counts greater than 10 are analyzed due to data unavailability. Death rate is measured as death per 100,000 population normalized by 2010 population. "The index might say that a community in coastal Georgia is not socially vulnerable, but it is vulnerable by itself because of its geographic location. Overall climate vulnerability is an indicator of all of these components together—social, climatic, geographic." While the study specifically examines the vulnerability in Georgia, its findings could be applied to other regions when specific adaptive capabilities of regions and localities are considered. "Our work is consistent with the broader science findings, but we wanted to take a closer look at home in a way that hasn't been done before," Shepherd said. Natural disasters: Is your municipality vulnerable? Got any Deniers in those spots? It will be interesting to see to what they ascribe their condition.